​​ SAN ANTONIO – If color brands like “bandana cherry,” “solar flare” and “brake lights” make you think of car finishes or fingernail polish, think again. 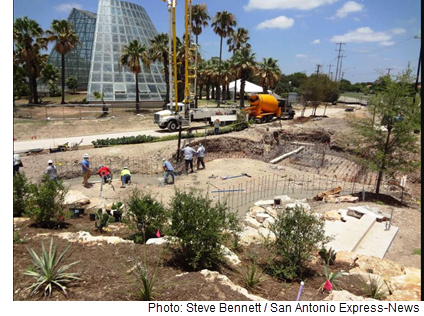 These are the warm tints of perennial flowers that are the flowering ​at the San Antonio Botanical Garden’s eight-acre, $22 million expansion opening October 28, 2017. Visitors now will drive through a curved concrete Garden Gateway, which provides a graceful, rhythmic new point of entry to the now 38-acre botanical garden, draws 150,000 visitors annually, one-third of them children younger than 13. The expansion, which was some 30 years in the making, reflects a new emphasis on interactivity at the garden. Construction continues on the new Family Adventure Garden (pictured above), set to open in March 2018.